Martin Eisner is Associate Professor of Italian Studies at Duke University. He specializes in medieval Italian literature, particularly the works of Dante, Petrarch, and Boccaccio, as well as the history of the book and media. He is the author of Boccaccio and the Invention of Italian Literature: Dante, Petrarch, Cavalcanti, and the Authority of the Vernacular (Cambridge University Press, 2013), which examines a single manuscript, Vatican Library, Chigi L V 176, written entirely in Boccaccio’s hand, which compiles works of Dante, Petrarch, Cavalcanti and Boccaccio himself. This study reveals Boccaccio’s key role in the creation of the Italian literary tradition not only as author of the Decameron but also as a scholar and scribe. The research and writing of the book was supported by the Mellon Foundation, the Institute for Advanced Study at Princeton, the American Philosophical Association, and the Fulbright Foundation. His new book project, Dante's New Life of the Book continues to integrate philological materials into literary criticism, but takes a diachronic instead of synchronic approach by analyzing the material tradition of Dante's first book, Vita nuova, from its earliest manuscripts to the most recent editions and adaptations. Experimenting with a new mode of literary history that takes the literary work’s survival seriously, the book both recounts a fascinating history of reception and rereads Dante’s enigmatic first book through the lens of these later transformations, alterations, and appropriations. This project received the Rome Prize from the American Academy in Rome. Eisner is also the editor-in-chief of a new online research project entitled Dante’s Library, sponsored by a Humanities Writ Large Grant, which aims to reconstruct the material texts of the literary, philosophical, and theology works that Dante would have known and read. He has also published several articles on Dante, Boccaccio, and Petrarch that have appeared in PMLA, Renaissance Quarterly, Dante Studies, California Italian Studies, Annali d’Italianistica and Le Tre Corone. 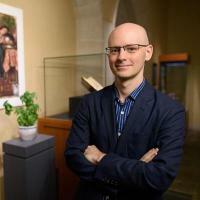 Martin Eisner (Ph.D., Columbia University, 2005) is Associate Professor of Italian Studies and Director of Graduate Studies for the Center of Medieval and Renaissance Studies. His research explores medieval Italian literature, particularly the works of Dante, Petrarch, and Boccaccio, as well as the history of the book and media. His first book, Boccaccio and the Invention of Italian Literature: Dante, Petrarch, Cavalcanti, and the Authority of the Vernacular (Cambridge University Press, 2013), joins material philology to intellectual history in its exploration of Boccaccio’s transcriptions of Dante, Petrarch, and Cavalcanti in Chigi L V 176. It argues that Boccaccio plays a key role in the creation of the Italian literary tradition not only as author but also as scholar and scribe. His new book project, Dante and the Afterlife of the Book: Rematerializing Literary History, continues to integrate philological materials into literary criticism, but takes a diachronic rather than synchronic approach in its analysis of the material tradition of Dante's first book, the Vita nuova, from its earliest manuscripts to the most recent editions and adaptations. His research has also been supported by the Fulbright Foundation, the American Philosophical Association, the Institute for Advanced Study at Princeton, and the American Academy in Rome. He has also published articles in PMLA, Renaissance Quarterly, Dante Studies, and California Italian Studies. He regularly teaches courses on Dante and Boccaccio that are taught in English with discussion sections for students who can read the text in Italian as well. Recent graduate courses include “Boccaccio’s Decameron and the Future of Literary Criticism," “Dante's Books,” and "Boccaccio's Women." "Mediating Dante: Boccaccio and the Transformation of a Modern Author. ", May, 2013, Dante Society of America, Annual Meeting, Cambridge, MA. Lily Auchincloss Rome Prize, American Academy in Rome (Medieval Competition)	2013-14. Rome Prize, American Academy in Rome (Renaissance Competition). Faculty Book Workshop, Andrew W. Mellon Foundation. Member, Institute for Advanced Study, Princeton, Institute for Advanced Studies. Franklin Research Grant, American Philosophical Society. Professor Eisner has a B.A. in Italian (1999) and a Ph.D. in Comparative Literature (2005) from Columbia University. His research and teaching focus on medieval Italian literature, particularly the works of Dante, Boccaccio, and Petrarch. He is in the process of completing his first book, tentatively entitled “The Poetics of Mediation: Boccaccio and the Cultivation of Italian Literature in the Age of Manual Reproduction,” which analyzes Boccaccio’s transcriptions of the vernacular works of Dante, Petrarch, and Cavalcanti in what is now the Vatican's Chigi L V 176. His next book project, "Rematerializing Literary History: The Afterlives of Dante’s ‘Vita Nuova’" continues to integrate philological materials into literary criticism, but takes a diachronic rather than synchronic approach in its analysis of the material tradition of Dante's first book, from its earliest manuscripts to the most recent editions and adaptations. He is also the author of published and forthcoming articles on Petrarch and Boccaccio. His other research interests include medieval lyric poetry, the European novella tradition, and material philology/textual theory/book history. For more bibliographic details, see his publications and honors. His courses on Dante and Boccaccio are both taught in English, but there will be discussion sections for students who can read the text in Italian as well. In the Spring 2010, he will teach a seminar for undergraduates and graduate students on The Materiality of Literature (RS150S/200S).